HI! DO YOU WANT TO BUY ONE OF MY CLOCKS? It's X.3 o'clock in base-twelve. "What the heck kind of clock is this? Why is 10 at the top? And why does the 11 look like a demented E?" The numbers on this clock are a futuristic-looking numerical system called base-twelve. Base-twelve is exactly like how we normally count except instead of counting in tens, we count in twelves. The explanation of why it is great to count in twelves is a bit long, but it is entertaining, I think. I put that below. If you like weird ideas that make some people SO MAD, you'll like reading it. If you are already in favour of a futuristic society where everyone counts in twelves, then feel free to order one of these great clocks. I really hope you do order one. The one thing in the whole world that we've all agreed on isn't that great of an idea. This is the story of one of the greatest inventions our species has ever seen. And, this is the story of how that invention could be improved. 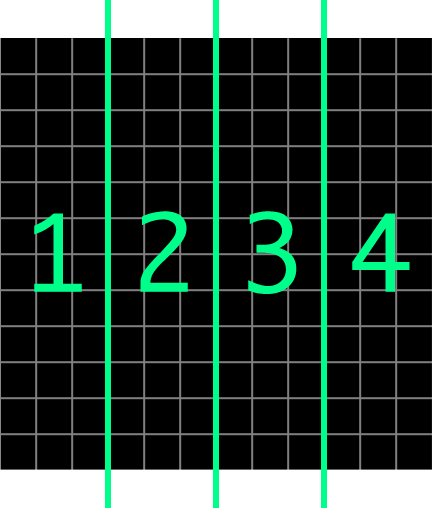 The simplest way to write numbers is to use just one symbol. If you are a cave person, you could draw five lines on the wall to represent five buffalos you saw. If you are an anatomically modern human playing bean bag toss at the lake, you could use a tally mark to represent one point in the game. Each line represents just one. But it becomes difficult to interpret the count at a glance when it gets higher than four or five. For example, what number is IIIIIIIIIIIII? The additional complexity of crossing every fifth line over the last four lines plays to a strength of our brain. We are good at interpreting symbols. We see each of the little gates not just as five individual lines, each line symbolizing a value of one, but also as a single unit: a symbol for five. It is a strong system and it is still used today by many people marooned on desert islands. We run into a familiar problem pretty soon, though, when we reach numbers like IIII IIII IIII IIII IIII IIII IIII IIII IIII IIII IIII IIII IIII IIII IIII IIII IIII IIII III. Here we've moved away from a direct relationship between the count and a number of lines. Significantly more brain power is needed to understand the additional abstraction. Rote memorization is needed. But it's child's play for humans. Or, at least if you force a child to learn it, she or he will. At first you'd think if we wanted to use these symbols to represent fourteen we'd write two of the characters that represent seven: "77". Seven and another seven make fourteen. That wouldn't be bad, but the problem is it requires arithmetic to interpret. The solution, another layer of abstraction in our numerical encoding, was one of the most significant breakthroughs our species has ever seen. The way it works is we assign different meanings for our numerical symbols depending on what position they occupy in a string. For example, in "107" the funny looking acute angle thing represents seven, but in "701" the same shape represents seven hundred. A symbol in the first column simply represents its native value. A symbol in the second column represents groups of ten. The native value of the symbol is the number of groups of ten. A symbol in the third column represents groups of ten groups of ten. This should be review for all the Grade One grads out there. It takes up a lot less space than cave people tallies, vastly simplifies arithmetic and works well for counting old school on ten-finger monkey hands, nature's abacus. It's an ingenious system used everywhere across the entire world. Its ubiquity is truly remarkable: there aren't too many other things we all seem to pretty much agree on. Instead of counting in tens, we should count in dozens. As you can see, we've added two new symbols. One for ten and one for eleven. We're using X and E because X is like the Roman Numeral and E because it's the first letter in eleven, but we could use a fishing rod and an axe instead if we wanted. Twelve breaks down really nicely into useful even-numbered factors. Not a great showing for the number we've chosen to use for all of our math. 20, 22, 24, 26, 28, etc. 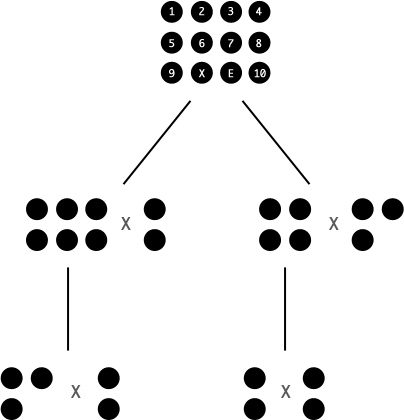 0, 2, 4, 6 and 8 keep repeating in every set because 2 fits evenly into ten 5 times. When we are counting in 2's, there is a five-number pattern, and if we are counting in 5's there is a two-number pattern. Because 10 = 5 / 2. They both divide evenly into ten. Isn't that so cool? But it's even better in base-twelve. Instead of having this benefit only for counting by 5's and 2's, in base-twelve, it will be equally easy to count in 2's, 3's, 4's and 6's (because they all divide evenly into twelve). If we are thinking in base-ten, we would look at the above clock and see we are at 1.25 hours, a quarter past one. A quarter in base-ten is 0.25 because we chop up the pie into ten pieces. 1/4th of ten is 2.5. But in base-twelve, we chop the pie into twelve parts. And a quarter of twelve is 3, as illustrated by the clock. So, 1/4 in base-twelve is 0.3. 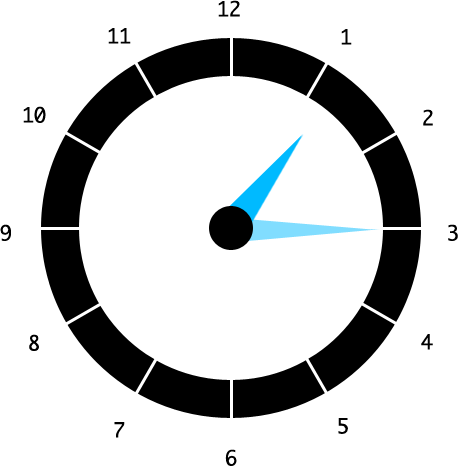 The symbols have changed, but the concept of the hour being divided into twelves has not. Base-twelve is better optimized for the pie slices we like best. Base-ten is good for fifths though. So if you ever need to divide a pie into 5 pieces, use base-ten. Quick! Add 1/3 + 1/4 in normal base-ten monkey-hands counting! What do you get? You were right if you got 0.583333333333... and then just cut off the repeating threes arbitrarily. In futuristic base-twelve, this all would have been so much easier. 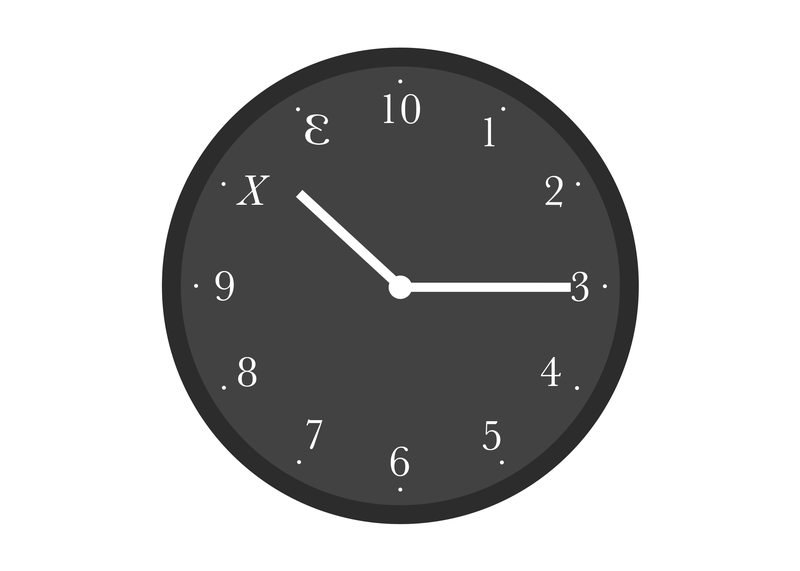 1/3 is 0.4 (just remember the analog clock face) and 1/4 is 0.3. So the answer is 0.7. There is a principle in design called The Rule Of Thirds that says that thinking of your design in three columns tends to work pretty well. We can do that easily with the twelve grid, of course. 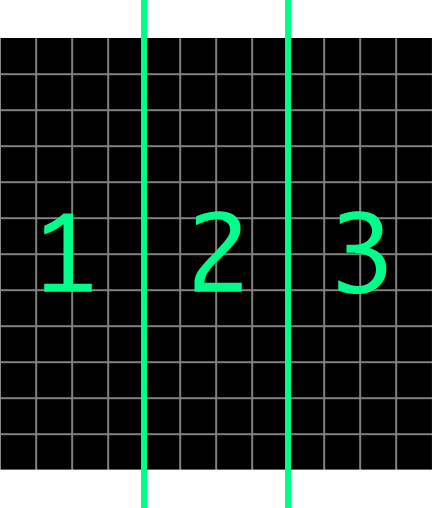 Thirds are not possible on a ten grid. Okay, but what if we want to work in quarters? Unfortunately, quarters are not possible in a ten grid either. 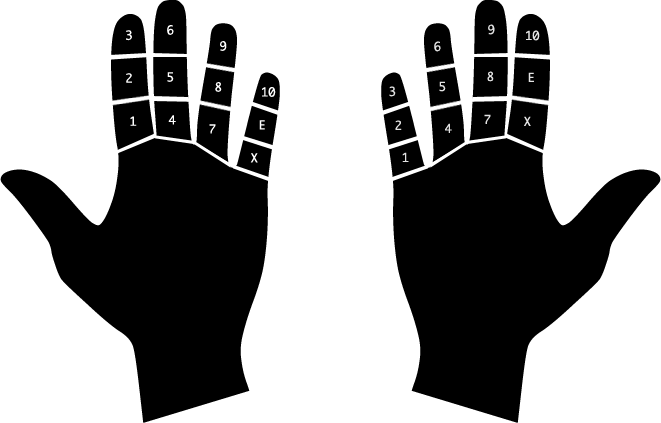 Both units are sub-divided into twelves: days into two groups of twelve hours, years into twelve months. 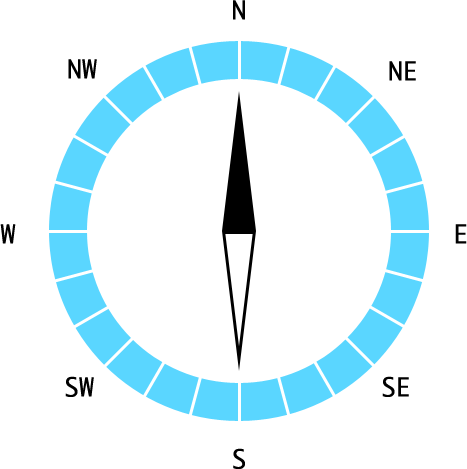 Twelves work well for circles, as in the clock. Three-sided shapes and four-sided shapes play well with twelves. Why do we use a numbering system that optimizes for the pentagon? There are two dimensions of music: pitch and time. In the music we are used to, both are in twelves or factors of twelve. The rhythm for almost all the music you hear has four or three beats per measure. It is hard to do-si-do to a song counted in fives. Pitch is like a spiral staircase. You can continue to climb in pitch but you keep returning to the same note. 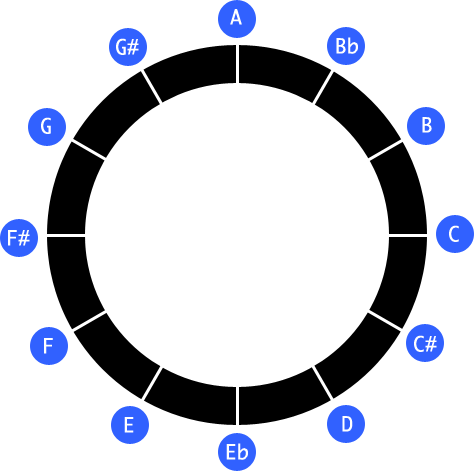 There are twelve equally-spaced steps from note to note: A, Bb, B, C, C#, D, Eb, E, F, F#, G, G# and then A again. Why music is in twelves is another story for another time. So why do we count in tens? Anthropologists think it's because we have monkey hands. We like to count up to ten on our monkey hands. If you use your thumb as a pointer, you can count up to a dozen on one hand. Plus, you use your other hand to keep track of a second digit. This way you can count up to a dozen dozens, which we would write as 100 in base-twelve or 144 in base-ten. And counting up to 144 is better than only up to 10. So anyway would you like to buy one of my clocks?